The Loire Valley Vineyard is one of 13 wine-making regions of France and one of the 16 great French vineyards, and the largest. Anjou-Saumur, Auvergne, Centre-Loire, Pays Nantais and Touraine. It represents 70,000ha of which 52,000ha were granted an AOC. The Loire Valley vineyard spreads over 800km. Loire-Atlantique, Vendée, Maine-et-Loire, Deux-Sèvres, Vienne, Sarthe, Indre, Indre-et-Loire, Loir-et-Cher, Cher, Nièvre, Allier, Puy-de-Dôme et Loire. From Nantes on the Atlantic Coast to Saint-Pourcain in Auvergne it encounters a wide array of soils. These range from sand, limestone, chalk (tuffeau-tufa), clay, silt, granites and gravels. The Loire Valley is very wide and therefore benefits from the oceanic air currents that go up the river. These currents indeed increase the temperature by a few degrees and create the perfect climatic conditions for wine-growing. King Henri IV already called the valley Douce France (mild) in the 15th century! This oceanic climate is, however, subject to temperate, continental and even mountain influences as we advance inland. The Romans planted the Loire Valley Vineyard some 2000 years ago on the south facing slopes of the river Loire. A stone wine press dating back to 100AD was found in Cheillé near Azay-le-Rideau. This was the time when Pliny the Elder already praised the qualities of the Loire Valley wines. Religious communities cleared the river's south facing slopes and planted the vines during the 5th century. The development of river transport triggered the expansion of viticulture during the 10th century. The reputation of the wines produced around Angers, Saumur and Orléans never ceased to increase until the 15th century. It reached new heights in 1532. Francois I indeed authorized the Breton States to trade with foreign countries and charge a toll fee for the water transport in Ingrandes. The tax enforced on the transportation of wine had the effect of forcing the winegrowers to produce quality wines in order to justify the high price of their wines. They indeed exported as far as England. The 18th century marked the end of this thriving trade. A severe frost of winter 1709 indeed destroyed part of the vineyard; then came the French Revolution (1789) and the Wars of the Vendée. The development of the railway in the mid 19th century precipitated the decline of the Loire Valley Vineyard, which was then competing with the wines produced in Southern France. Then came phylloxera that destroyed the entire French vineyard between the late 1850s and 1870s. The Loire Valley Vineyard (as all other French vineyards) was entirely replanted with french grape varieties grafted onto American root-stocks resistant to the parasite. 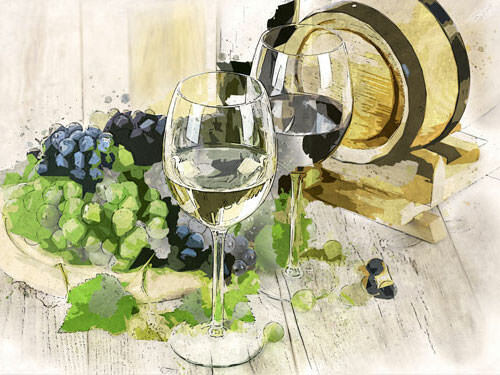 Viticulture was relaunched and wine-growers targeted the production of high quality wines. Muscadet, Sancerre and Vouvray were the first vineyards of the Loire to be granted an AOC by the INAO in 1936. The Loire Valley Vineyard produces 45% of dry and sweet white, 23% of red, 21% of pink and 11% of sparkling wine. 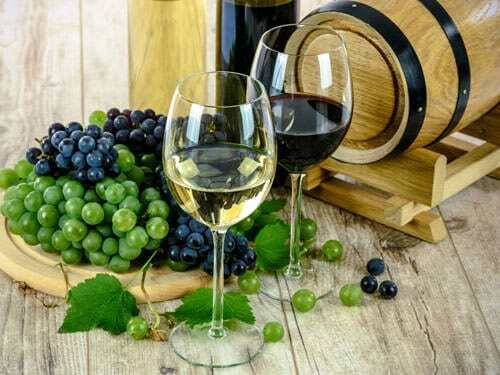 It has the largest array of wines produced from a large selection of grapes varieties. The whites are mainly produced from Chenin Blanc, Melon de Bourgogne and Sauvignon Blanc; the reds from Gamay, Cabernet Franc and Grolleau. The Chenin Blanc is the emblematic grape variety of the Loire Valley Vineyard. It is locally known as Pineau de la Loire and produces wonderful white wines. Loire Valley wines are less expensive than the Burgundy and Bordeaux but are equally splendid and considered better value for money. Here are these vineyards from west to east. The Pays Nantais Vineyard is the westernmost wine-making area of the Loire Valley Vineyard. It is located south of Nantes and in the departments of Loire-Atlantique, Maine-et-Loire and Vendée. The vines enjoy the influence of the temperate oceanic climate. The Anjou-Saumur Vineyard spreads over 20,000ha and is bounded by Angers, Chalonnes, Bourgueil and Saumur. It produces 31% of red, 35% of rosé, 18% of white and 16% of fizzy and was granted an AOC in 1936. The 5500ha Touraine vineyard is located along the rivers Loire and Cher, between Saumur and Orléans. It spreads in 70 municipalities located in the Indre, Indre-et-Loire, Loir-et-Cher, Loiret, Sarthe and Vienne departments. 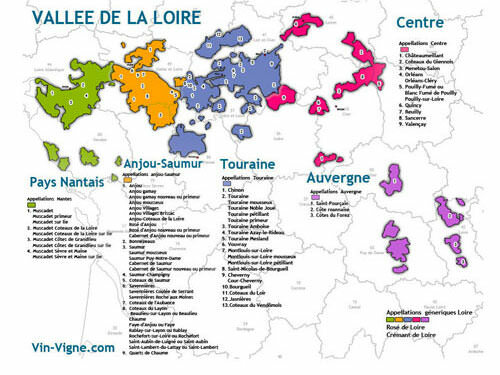 The Centre-Loire Vineyard stretches in the Cher, Indre, Loir-et-Cher, Loiret and Vienne departments. It benefits from an oceanic climate with occasional continental influences. The Centre-Loire Vineyard mostly produces wonderful white wines (but also reds and rosés), among which the most renowned are the Sancerre and the Pouilly-Fumé. The Auvergne Vineyard is one of the oldest vineyards of France; it is laos the most upstream of the wine-making areas of the Loire Valley Vineyard. The reputation of the wines from Auvergne, in Central France, goes back to the Middle-Ages and traversed the centuries. The Auvergne Vineyard today stretches in the Allier, Puy-de-Dôme and Loire departments .